This is an excellent devotional. 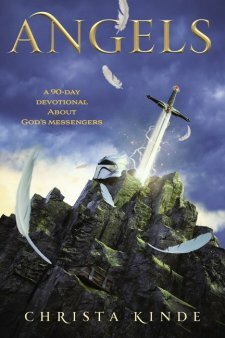 Each of the 90 devotions are approximately two pages, starting with a Bible reference about angels, then an applicable Bible story, commentary on Scripture, or Q and A, and ending with questions leading the reader to consider Scripture, cultural relevance of the subject, or personal introspection. Aimed at ages nine and up, I am impressed by the depth and scholarship of each devotion. A pre-teen would be engaged by this, as would an adult. Kinde brings out over one hundred verses about angels, and addresses common myths compared to what the Bible reveals, as well as detailing accounts of how biblical characters responded to meeting angels, and even going beyond angels to draw attention to larger spiritual truths (e.g. how angels demonstrate pure worship for us to model, or in understanding the work of the enemy through fallen angels/demons). I received a complimentary copy of this book from Zonderkidz.